Can you believe another whole week has gone by since my last Costco report? Three things to report on today: one, if you like the Martha Stewart chicken slab pies, go stock up on them because I think they are being closed out. Anything with a price ending in a "7" means they have been discontinued; the slab pies have been priced at $4.97 with plenty in the freezers for months now, but today there were only a few, stacked on top of another frozen food item so I think they aren't finally going bye-bye. We now have four boxes of these caloric things in our freezer. Second, in the interests of health to combat the evil slab pies, I bought a bag of walnuts. That seems to be the latest miracle food that cures everything so because of that plus they are cheaper than the pine nuts, I bought a 3-pound bag. Third and finally, I hope I didn't make a mistake buying the chile-lime chicken strips. These kind of things are hit and miss and the problem is if they are a miss, you still have a rather large quantity remaining. Oh well, I'll let you know how they are. Yesterday I mentioned the quest for gumbo. 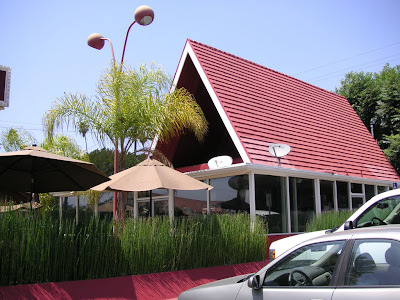 Where did we wind up going for lunch? 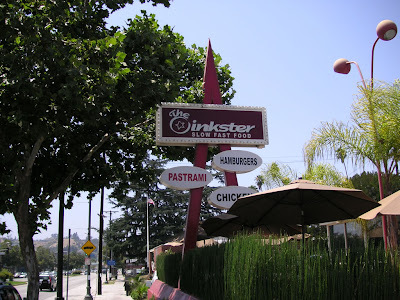 The Oinkster, in Eagle Rock. Yeah, real gumbo, lol.. 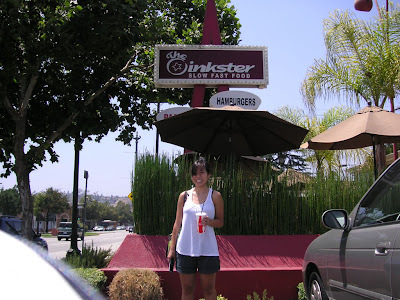 I've been wanting to try the place for a while and Katie had no preference so that's where we ate. Most every time I take my camera, I forget to take a picture of the food. By the time I remembered, most of it was gone. I'll just have to tell you what we had. 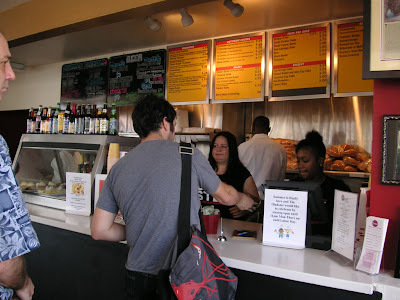 Katie had the rotisserie chicken and I had the rotisserie chicken salad sandwich. Both came with excellent belgian fries and dragon breath garlic mayo. I actually had my eye on the pastrami or pulled pork sandwich but decided to try and be a little bit healthier so I opted for the chicken instead. Now from the good to the bad. The woo-woo dog is back next door. Normally there is one dog but once in a while this guest dog comes to stay for a while and it has the most annoying and pathetic bark, with which it likes to annoy and pathet everyone in the neighborhood. I call it the woo-woo dog because it sounds like it swallowed an accordion when it barks (no offense to any of you who play the accordion.. you know who you are, haha.. you can do so but dogs simply should not be allowed anywhere near one). An accordian with asthma, no less. Woo woo woo.. woo woo woo.. it just kept wheezing and wheezing those woos. Julie thinks it is predicting an earthquake. I say it's just plain stupid. Woo woo woo..